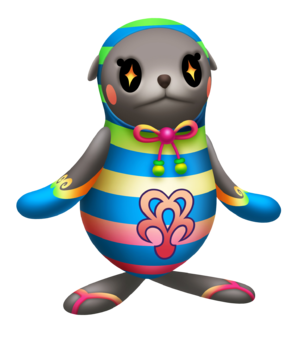 The R & R Seal is a Dream Eater that appears in Kingdom Hearts 3D: Dream Drop Distance and can be obtained from an AR Card. The R & R Seal has a predominately grey body with orange-yellow swirls leading to blue flippers. Its feet have pink/yellow "sandals". It is "wearing" a blue striped "bathing suit", the other stripes fade from green to yellow, and end as pink. It has a pink and green bow around its neck. Its eyes are black with yellow "sparkles" as the pupil and pink cheeks. The first part of its English name, "R & R", stands for "Rest & Relaxation", something that vacationers usually seek when on vacation, and is a nod to its Japanese name "Vacances Seal". ↑ 1.0 1.1 1.2 1.3 1.4 1.5 1.6 Becomes available after Secret: Green at B-1 has been unlocked. ↑ 2.0 2.1 2.2 2.3 2.4 2.5 2.6 Becomes available after Secret: Green at D-1 has been unlocked. ↑ 3.0 3.1 3.2 3.3 3.4 3.5 3.6 3.7 Becomes available after Secret: Green at C-4 has been unlocked. ↑ 4.0 4.1 4.2 Becomes available after Secret: Green at C-6 has been unlocked. ↑ 5.0 5.1 5.2 Becomes available after Secret: Green at A-4 has been unlocked. ↑ Becomes available after Secret: Green at E-2 has been unlocked. The R & R Seal can be created through a rank C recipe in the NA and PAL versions. The R & R Seal Recipe can be purchased from the Moogle Shop. The R & R Seal can be created through four different recipes.